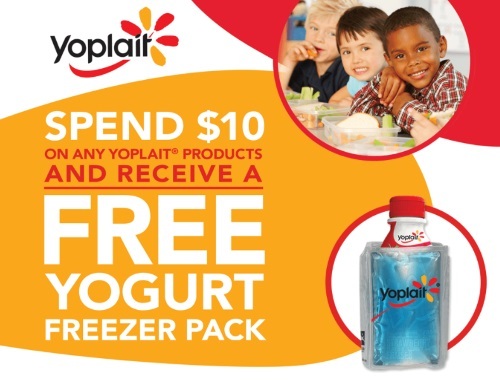 Yoplait has a new Free Yogurt Freezer Pack Offer! Get a Free Yogurt Freezer Pack when you purchase $10 of participating products at Walmart! Purchase ten dollars ($10) worth (not including taxes) of participating products on one (1) WalMart receipt (the “Receipt”), during the Offer Period. Offer begins on Thursday, August 24, 2017 at 12:00:00 a.m. Eastern Time (ET) and ends on Tuesday, October 31, 2017 at 11:59:59 p.m. Participating Products: Yoplait® Tubes® (8x60 g, 24x60 g), YOP® Drinkable (200 mL, 12x200 mL, 1 L), Yoplait® Minigo® Yogurt (6x60 mL, 6x93 mL), Yoplait® Minigo® Drinkable Yogurt (6x93 mL), Yoplait® Whole Milk Yogurt (12x100 g), Yoplait® Source® Yogurt (16x100 g, 16x90 g, 650 g), Yoplait® Creamy (16x100 g), Yoplait® Source Greek (8x100 g), (the “Participating Products”). Participating Products are subject to availability.